Below is a list of all Bowness-on-Windermere Hotels with Websites, Images, Phone Numbers and links to Maps and Reviews. The piers at Bowness-on-Windermere are where most of the tourist attractions and boat trips are situated. The Town of Windermere is situated next to Bowness and the town of Ambleside 5 miles north with its Waterhead Pier for boat trips between Bowness & Ambleside. Google Map. Macdonald Old England Hotel & Spa AA 4 Star, situated in the centre of Bowness on Church Street with views over the boat trip piers on Lake Windermere. Tel: 0844 879 9144. Belsfield Hotel & Restaurant VE 3 Star, situated in the centre of Bowness on Kendal Road with views over the boat trip piers on Lake Windermere. Tel: 01539 442 448. Stags Head Hotel & Bar Diner NC, situated in the centre of Bowness on Church Street only 200 yards from the boat trip piers on Lake Windermere. Tel: 01539 443 132. The Albert a Robinsons bar/diner with rooms SC 3 Star, situated in the centre of Bowness on Queens Square about 2 hundred yards from the boat trip piers on Lake Windermere. Tel: 01539 443 241. The White House Restaurant with Rooms Situated in the town centre on Robinson Place. Restaurant with rooms, good food, friendly staff and a pleasant experience. Great if you're looking for a lite bite. Tel: 01539 444 803. The Royal Oak Inn & Bar Diner VE 3 Star, situated in the centre of Bowness on Brantfell Road about 300 yards from the boat trip piers on Lake Windermere. Tel: 01539 443 970. The Angel Inn SC 3 Star, situated in the centre of Bowness on Helm Road only a few hundred yards from the boat trip piers on Lake Windermere. Tel: 01539 444 080. Hydro Hotel SC 3 Star, situated in the centre of Bowness on Helm Road 0.5 of a mile northeast of the boat trip piers on Lake Windermere. Tel: 01539 444 455. Burn How Garden House Hotel AA 3 Star, situated in the centre of Bowness on Back Belsfield Road 0.3 of a mile southeast of the boat trip piers on Lake Windermere. Tel: 01539 446 226. Burnside Hotel & Parklands Country Club VE 3 Star, situated in the centre of Bowness on Kendal Road 0.3 of a mile southeast of the boat trip piers on Lake Windermere. Tel: 01539 442 211. Craig Manor Hotel & Restaurant AA 3 Star, situated in Bowness on Lake Road 0.5 of a mile northeast of the boat trip piers on Lake Windermere. Tel: 01539 488 877. Lindeth Howe Country House Hotel VE 4 Star, situated in Bowness on Windermere on Lindeth Drive/ Longtail Hill about 1 mile southeast of the boat trip piers on Lake Windermere. Tel: 01539 445 759. Hillthwaite House Hotel SC 3 Star, situated in the centre of Windermere on Thornbarrow Road 1 mile northeast of the boat trip piers on Lake Windermere. Tel: 01539 443 636. 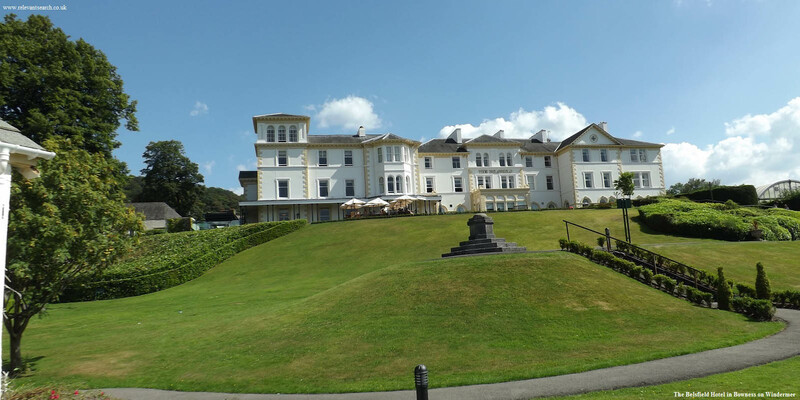 Aphrodite's Lodge Hotel & Spa SC 3 Star, situated in Bowness on Windermere on Longtail Hill 1 mile southeast of the boat trip piers on Lake Windermere. Tel: 01539 445 052. Ryebeck Hotel & Restaurant VE 3 Star, situated in Bowness on Windermere on Lyth Valley Road 1.2 miles southeast of the boat trip piers on Lake Windermere. Tel: 01539 488 195. Gilpin Hotel & Restaurant AA 4 Star, situated in Bowness on Windermere on Crook Road 1.3 miles southeast of the boat trip piers on Lake Windermere. Tel: 01539 488 818. The Ellery Inn & Diner SC 3 Star, situated in Windermere on Cross Street 1.6 miles northeast of the boat trip piers on Lake Windermere. Tel: 01539 488 464. Windermere Hotel SC 3 Star, situated in Windermere on Kendal Road 1.7 miles northeast of the boat trip piers on Lake Windermere. Tel: 0844 499 9357. Cedar Manor Hotel & Restaurant SC 3 Star, situated in Windermere on Ambleside Road 1.8 miles northeast of the boat trip piers on Lake Windermere. Tel: 01539 443 192. Storrs Hall Hotel & Restaurant AA 4 Star, situated in Storrs Park/ Bowness-on-Windermere 2 miles south of the boat trip piers on Lake Windermere. Tel: 01539 447 111. Windermere Manor Hotel & Restaurant AA 3 Star, situated in Windermere on Rayrigg Road 2 miles northeast of the boat trip piers on Lake Windermere. Tel: 01539 445 801. Briery Wood Hotel SC 3 Star, situated in Windermer on Ambleside Road 2 miles north of the boat trip piers on Lake Windermere. Tel: 01539 33 316. Cuckoo Brow Inn SC 4 Star, situated in the Village of Far Sawrey 2.5 miles southwest of the boat trip piers on Lake Windermere on the west side of the lake, via a ferry. Tel: 01539 443 425. Beech Hill Hotel & Restaurant AA 4 Star, situated by Lake Windermere on Newby Bridge Road 3 miles south of the Bowness-on-Windermere boat trip piers on Lake Windermere. Tel: 0844 50 27587. Low Wood Bay Hotel & Restaurant AA 4 Star, situated by Lake Windermere on Ambleside Road 4 miles north of the Bowness boat trip piers on Lake Windermere, 1 mile south of the Waterhead Pier at Ambleside. Tel: 01539 433 338. Damson Dene Hotel AA 3 Star, situated at Crosthwaite 4 miles southeast of the Bowness boat trip piers on Lake Windermere. Tel: 01539 568 676. Langdale Chase Hotel & Restaurant VE 3 Star, situated by Lake Windermere on Ambleside Road, about 4 mile north of Bowness pier. Tel: 01539 432 201. The Samling Hotel AA 3 Star, situated by Lake Windermere on Ambleside Road about 4 miles north of the Bowness boat trip piers on Lake Windermere, 1 mile south of the Waterhead Pier at Ambleside, set in its own sixty-seven acre estate. Tel: 01539 431 922.